Lets talk about what happens if CheneyBush attacks Iran. We have about 160,000 troops in country, maybe another 50,000 to 60,000 in Kuwait, etc, etc, and also deployed on ships in the gulf itself. Majority of whom are on their 2nd or 3rd tour of duty. We have a carrier or two in the Gulf and that has to be a significant number of attack aircraft and of course, bombers. The Iranian regular army stands at 350,000. Their is an additional 125,000 in the Revolutionary Guard and they field a civilian Baseej paramilitary force of up to a million. Yes, a million paramilitary. That's what won them the Iran/Iraq war (1980-1988). They don't have anywhere near the air strength of the U.S. but they can mobilize Shabab 2's and Shabab 3 rockets. They have a range of up to 1,200 miles. They also have bought rocket-torpedoes from the Russians, mini-subs, lots of mines, and have a large fleet of small fast attack (PT) boats. Did I mention lots of mines. The Iranians are also rumored to have a fairly good pilot-less drone aircraft capability. Supposedly they were able to shadow a U.S. carrier in the gulf for 6 hours some months ago. Clearly their underwater warfare and fast attack capability is well advanced and formidable. From an armchair strategy position I would have to expect them to sink at least 1 U.S. battle carrier. Thats 5,000 men right there. If war breaks out, the straight of Hormuz will be effectively shut down. 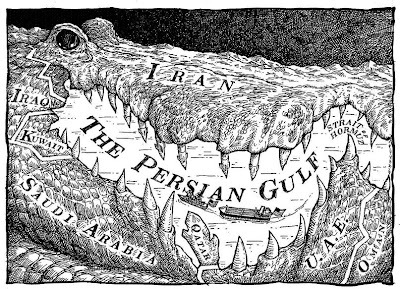 The Iranians themselves control 20% of the worlds oil supply. I am not sure how much more would be affected by the closure of the Gulf. I would expect that $100 barrels of oil would seem very, very cheap at that point. After sinking some of our Navy I expect they then would cross the border. Probably the U.S. would launch tactical nukes. These have a somewhat limited destructive power, not like actual nuclear warheads. So, the Iranians would lose a large portion of there military. However, Its not like they will have a problem finding our central command and control. Its right there in the center of Baghdad. Our guys would fight hard. They won't be all rested up like the Iranians and we would quickly need resupply which would be slow. I don't think we could fly that much in. The shoulder launched rockets would prohibit slow moving transport planes. On the bright side, we don't have to worry about a fighting withdrawal. There will nowhere to withdrawal to.